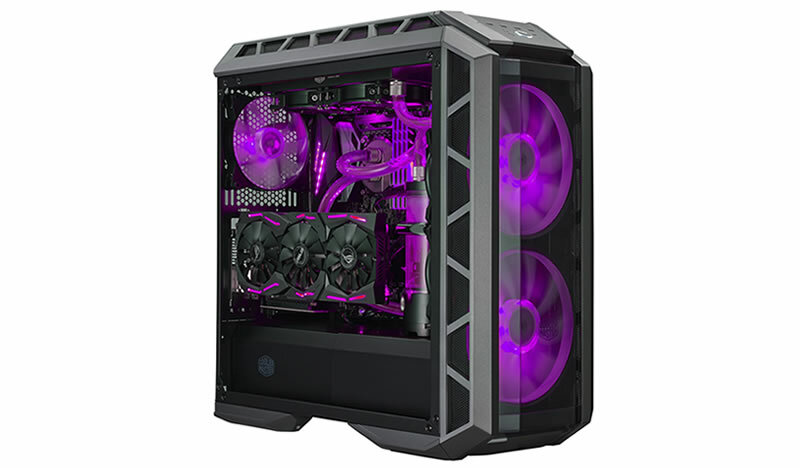 The Cooler Master MasterCase H500P is the latest addition to the modular MasterCase series, though it can be seen that it is inspired by the old high airflow (“HAF”) line of cases, featuring a monster 200mm intake fans and a general “rugged and futuristic design. The HAF Series Is Back & Better Than Ever Before with the H500P ! The Cooler Master H500P is focused on bring the HAF series back. With dual 200mm RGB fans at the front for intake which come with the case, it proves to be less noisy and promotes better airflow as compared to the basic 120mm or 140mm options. The static pressure is also lower, but we will be able to test all of this in some time in the future. The front intake is installed through the mesh on each side and the top and bottom of the curved acrylic front panel. 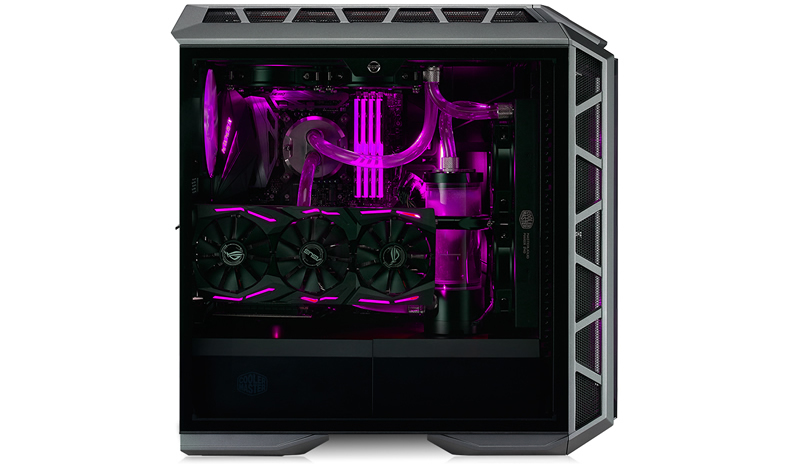 The H500P features two 200mm RGB fans which are included at the front but it also has the capability to house three more 140mm fans at the top — above the top chamber – or otherwise three 120mm fans in the lower chamber of the top panel. A fan mount or 140mm radiator is available at the rear side too. After an overall look, it can be said that the H500P is a chassis that is pretty user-friendly because of the great amount of features it offers. The front and top panels are both removable, the tempered glass side panel can be attached through a single latch mechanism, it also features a removable two-piece power supply shroud, plus it comes with a large cable management plate and those two huge RGB fans are also plus points. Among the most hard parts of dismantling a case is usually the part where you have to try to take off the front panel, and it appears to be that Cooler Master has remarkably made this part quite easy for the users by using plastic tabs which loosely set into the socket and have replaced the common stiff alligator clips or latches. Though they might have wandered away too far in the different direction. Keeping the H500P will require some extra care and precautions because the top and front panels are not likely to support any weight at all without popping off. The majority of users will not be picking their cases up regularly, and still many users also won’t be taking those panels off on a regular basis: well it is a strange compromise that is able to be solved using a few well-placed thumbscrews or an alligator clip, and the compromise is the potential to drop a case. To round things off, the H500P is no doubt a pretty good case from Cooler Master. It has brought the HAF series right into 2017, along with an addition of tempered glass, RGB fans and amazing air ventilation, this is one of the finest cases of 2017.